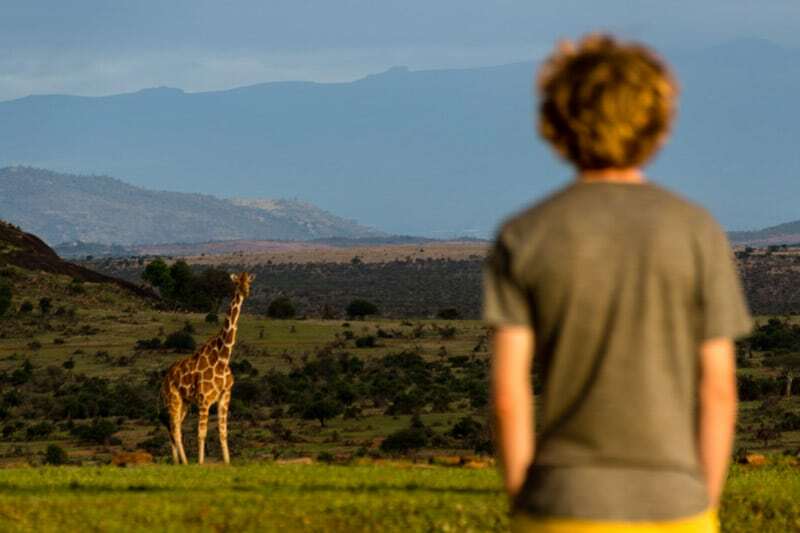 We got invited by Ol Jogi Wildlife Conservancy in Kenya to stay for two nights. Now imagine having a whole game reserve to yourself for a few days… Well, that’s exactly what Ol Jogi offers: exclusivity of 58,000 acres of pure nature and wildlife with a large portion of luxury accommodation and top end service. Watch this for a taste of this magnificent landscape. The owners of Ol Jogi are extremely dedicated to wildlife conservation – in fact, the funds they receive from tourism only cover about 50% of the cost needed to protect the wildlife that roam these lands. They strongly believe in a low-impact, high-gain philosophy. 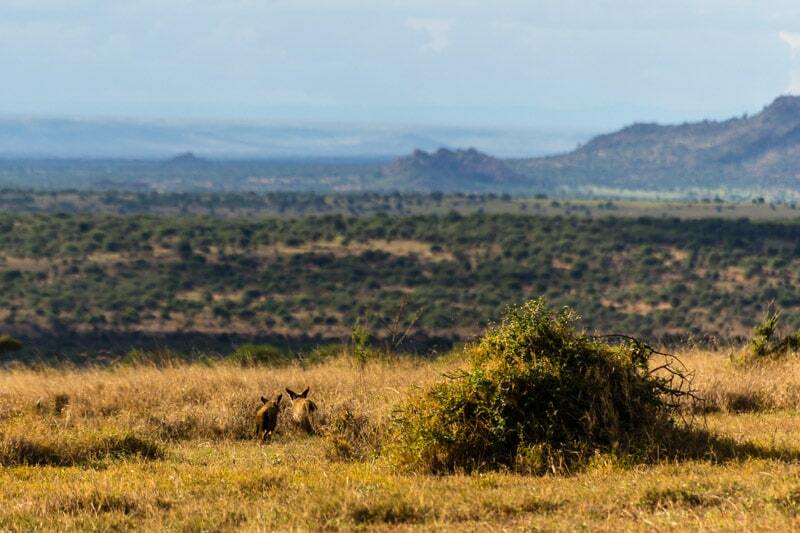 This philosophy of land just for wildlife had lead them to keep the conservancy tourist free for many many years. However, the high cost of rhino conservation meant that tourists would need to be introduced in the conservancy, but with a twist. This unusual business model of exclusivity has opened up a truly unique holiday. It has helped with vital costs needed to protect rhinos and all wildlife within their borders. We cycled past the inconspicuous sign saying Ol Jogi Conservancy. Jamie, the conservancy manager, came to greet us with a big smile. He immediately made us feel welcome. 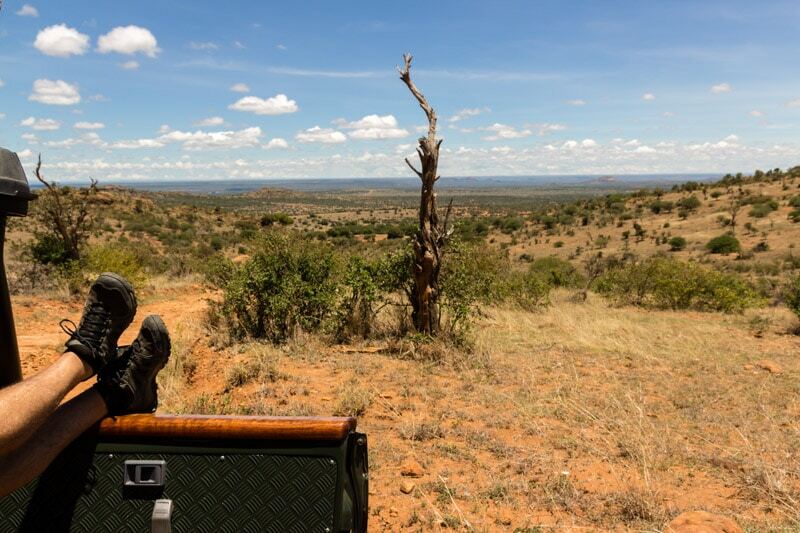 After a hot shower and a game drive to meet the resident rhinos, he drove us to a rocky outcrop. When we walked to the top, we saw the most magnificent view hiding behind it. 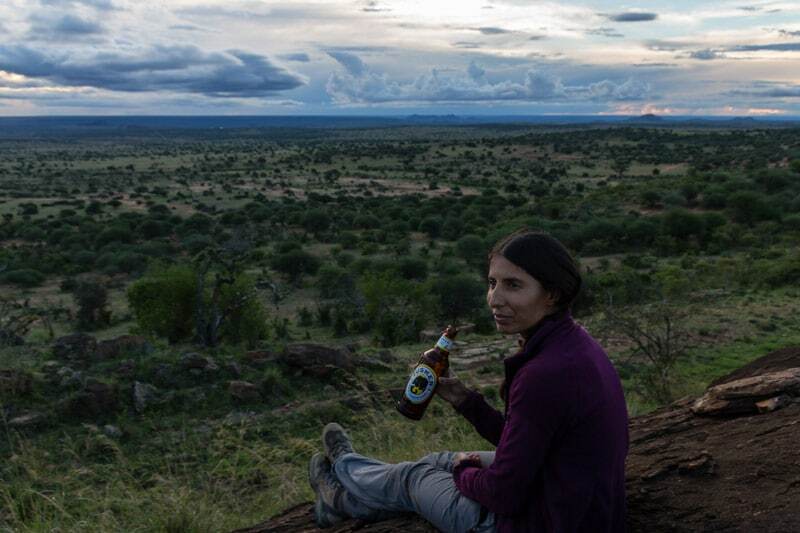 We sat down and enjoyed a sundowner with Kenya’s finest: Tusker beer. Jamie filled us in on the history of this pristine land and their approach to conservation. Sundowner with the best view! The next day we met Meimei, the adorable baby rhino that will steal your heart. Meimei was born blind. She was found a few days after birth and had to be taken away from her mother, otherwise she would not have survived. They treated her eye condition and now she has regained full sight. Fortunately for her, Meimei has an amazing team of carers and rangers parenting and protecting her until she is old enough to fend for herself. She is just two years old, still a toddler. Her dedicated carers are showing her how to feed by placing acacia branches on the boma fence. That’s not all.. when we walked into the boma we heard a high pitched noise. It sounded like it came from an animal the size of a mouse. But then we saw her – Meimei… this big, round, unbelievably adorable baby rhino making this tiny, high pitched sound. She was calling for her bottle. Not wasting any time, a 10L bottle was mixed for her and guess who got to give her the bottle – yours truly. Yes. I got to give this adorable, not-so-little creature her baby bottle. She polished it off in about 1 minute. A feeling of warmth and some serious emotion came over me while looking down on her feeding. She looked like the most precious thing I had ever seen. I was especially thankful in that moment for Jamie and his staff for saving her life. And nope, that wasn’t all. After feeding her, I followed her to big pile of mud. Before I knew it she had plumped herself right down in the centre of it… I was going to give her a mud bath!! A mud bathhhh!!! Oh man. I couldn’t believe it. As if she wasn’t cute enough. Myself and two of her carers spread the thick mud all over her skin. We covered her feet, her trumpet-shaped ears, even her eyelids. She just closed her eyes and enjoyed her personal massage. She got up once to turn herself over.. That was more than enough effort and by the time we had finished bathing her she was already in dreamland. When she got up… people kept their distance to make sure she didn’t decide to rub the mud off on them. 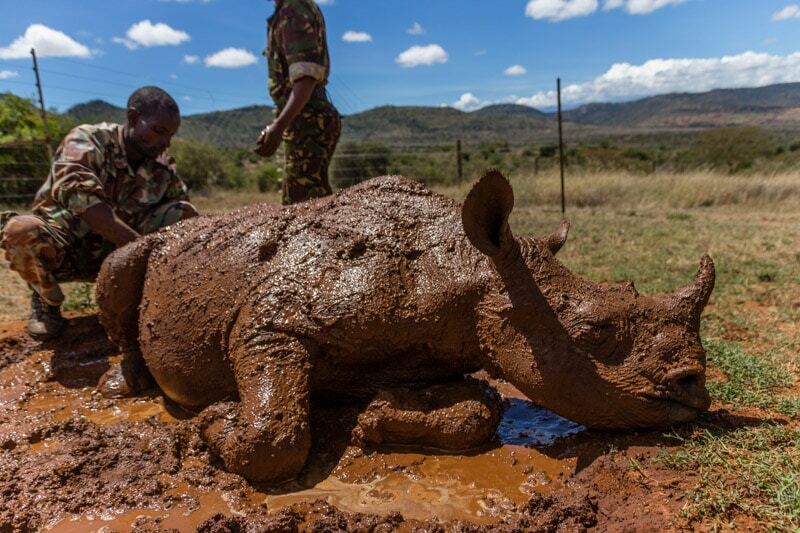 At some point, she will be be able to take a mud bath on her own – a very important task for a rhino. The mud protects her skin from the sun. After it dries, she will find a tree to scrub it off along with any ticks. At 4 years old, she will finally ‘leave home’ and be out of the boma for most of the day, learning how to be a mature rhino and survive in the open bush. Her carers will stay by her side during this time until they are happy she can care for herself. She is not the only rhino that has come through the Boma. Currently, there are two older rhinos in the process of going back to the wild: Alfie and Bobbie. They came to the boma as babies and have now been given another chance at life. This is only possible due to the dedicated and selfless staff at Ol Jogi who put the rhinos first and themselves last. 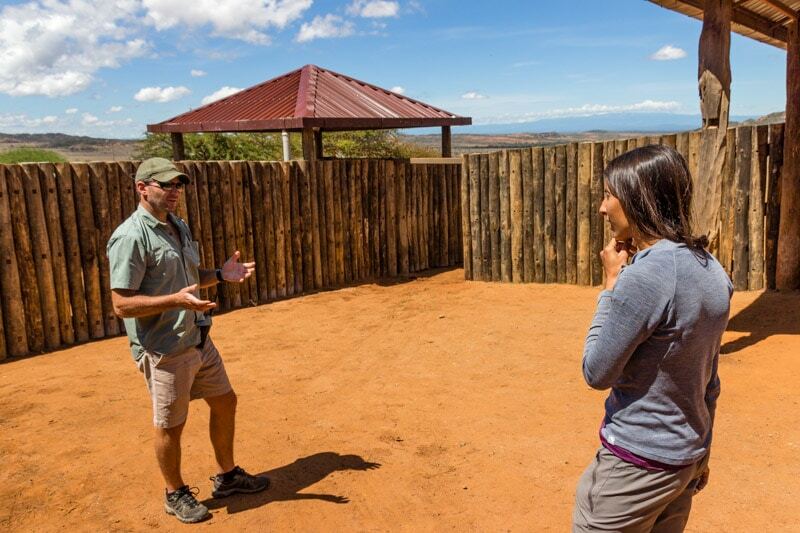 The boma itself was also made possible by Save the Rhino International. The more we learn about this charity organisation, the more and more impressed we are. 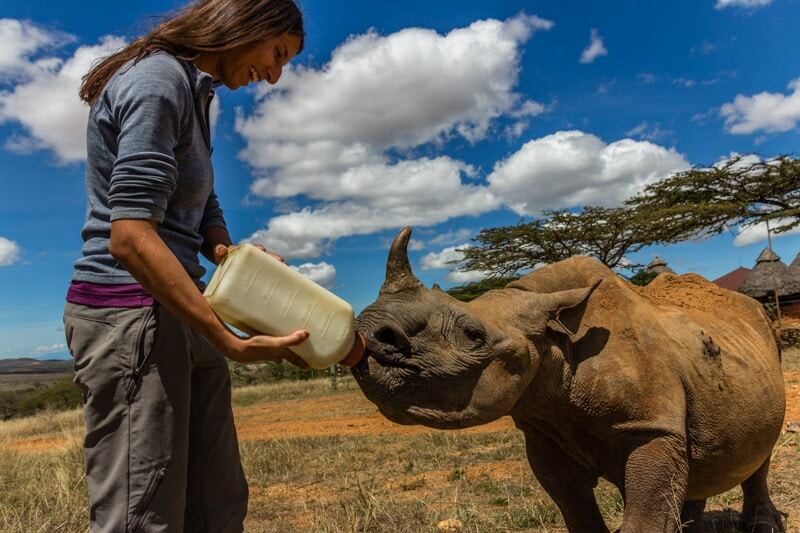 The amazing thing about Save the Rhino is that they enable people in the country who are already doing a fantastic job to keep on doing just that. They don’t tell them what to do or how to do it – they provide support, coordinate and fund many projects that they know will work. 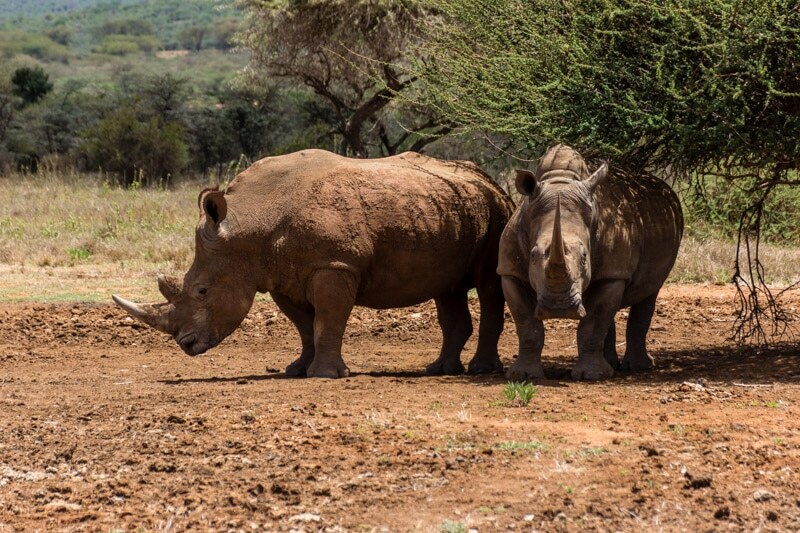 This boma is a great example of local conservationists and Save the Rhino working together in partnership to do the best job possible. The result in this case is three healthy East African Black Rhinos in the dwindling population of only 5,000 left. Not far away, just a few 10s of km.. the reality of extinction is very real. The last male Northern White Rhino died in March 2018, meaning a probable end to his subspecies. 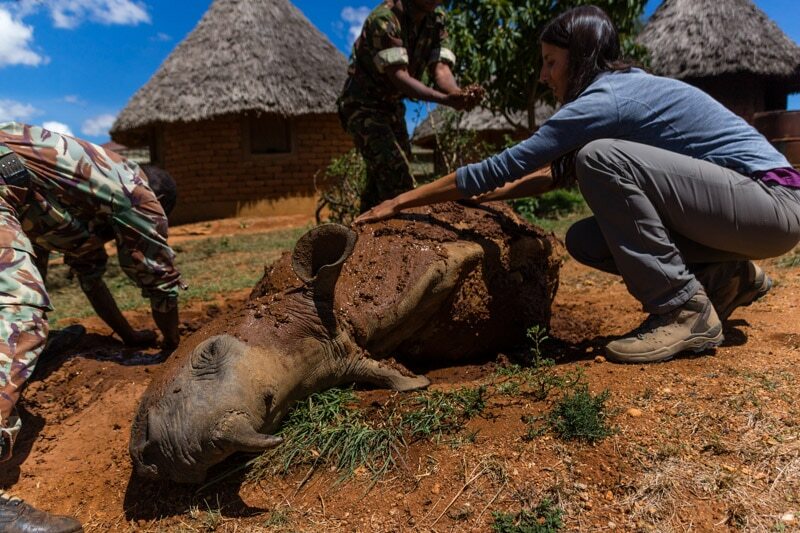 Save the Rhino are doing a very good job to make sure this doesn’t happen again. If you agree, please consider donating to this cause at our Virgin Money Giving page. 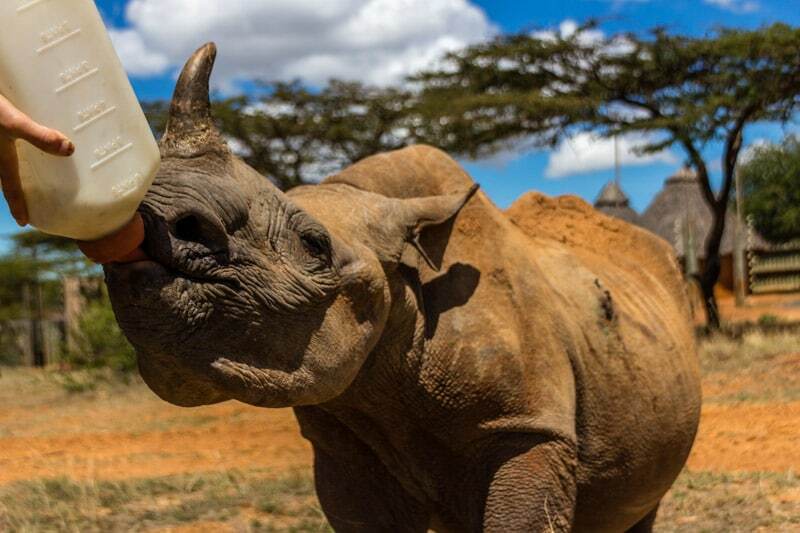 All donations go directly to Save the Rhino who support Jamie, his staff and their work at the rhino orphanage. Alternatively, you can donate directly to Ol Jogi Wildlife Conservancy here. If you know anyone who might be interested in donating, please share Meimei’s story. There are many ways to help. Thank you from us and especially thank you from Meimei!